For most of the people in Second Life™ the new Fitted Mesh simply means we will soon have mesh clothes that fit our shape. I think that is pretty much correct. There is also a group of us that are curious about how the new collision bones work and what that means for those of us making clothes. But, the changeover to Fitted Mesh Clothes is going to have a much larger impact. It is going to affect everyone. Being able to use the collision bones to make clothes that adapt to each avatar’s shape is a big plus. But, building those clothes is going to be more complex. That means several things. One of course is new designers have more to learn. Another is customers are going to have to deal with finding out who knows how to make well made Fitted Mesh Clothes. We faced most of those problems with the Mesh Deformer too. If we designed for the now defunct Mesh Defomer we had the complication of understanding how importing and exporting changed shapes and how to compensate. Gaia Clary at Machinimatrix.org made a tutorial to demonstrate the problem. We also had the problem of dealing with extreme shapes. They just did not work well. Thus we were considering using different base shapes to handle extreme shapes. That was going to confuse things for everyone, buyers and creators. It was going to be a Market Place nightmare. Fitted Mesh solves some of the extreme shape problem. Now our clothes will work as well as the avatar does, which debatably may not be that great. Regardless of how well it does or doesn’t work for extreme shapes, it is all similar and thus easier to explain to the new people and deal with. However, with Fitted Mesh we now also have to deal with weighting our creations to work with more bones. We can’t just weight to the collision bones and be done. Instead we have to weight to the basic bones we have used forever and ADD weighting for the collision bones. It gets complicated. I’ll explain why. In image 1 I have started to prepare a new base for making knee length skirts with the new Fitted Mesh weighting. I’ve trimmed the lowerbody mesh, frozen the mesh, and set rigging for Fitted Mesh. See image 2. In version 936 of the Avastar add-on clicking Weight (3) enables Volume, which I think are the older collision bones used by makers of Liquid Mesh, and Deform, which I think includes all the newly added collision bones. I enabled SL Base to make image 1. In image 1 the blue bones are generally the SL Base bones, those we have always used for animation and rigging. The red bones are collision bones. These are the bones we will use to make our mesh clothes Fitted Mesh. But, it now appears we will have to use both sets of bones. After all that is what the SL Avatar is doing. We can’t just use one or the other. We have to use both. I’ll explain what I know now. If we move the SL Base bone in pose mode we get an odd but somewhat expected movement and mesh deformation. Image 3. I didn’t get the right weighting or attempt fix it for this illustration as it is not important to the point. So, you see the bonse moving outside my future skirt. However, if we only weighted to the collision bone and tried to rotate the collision bone then things get strange. In Image 4 I have rotated the collision bone. The mesh deforms, but not as we would want. Also, the SL Base bone mHipLeft is not following along. Everything is warping in ways that are not going to work for us. In Image 1 you can notice the collision bone is following the SL Base bone. Since the animations in SL use the SL Base bones all the weighting is designed for those bones. New Fitted Mesh clothes will have to work with all those animations. Until now, morphing has been used by the SL Viewer Appearance to control much of the avatar’s size and shape. Body fat and similar settings are dependent on a blend of morphing shapes built into the viewer to change the avatar shape/appearance. You can easily see this in Blender if you have the Avastar add-on. Otherwise, you’ll have to learn how to use Blender’s shape tools to see it in action. Also Avastar closely approximates the SL Viewer Shape setting values and labels. Using plain Blender you work with different values and labels directly taken from the SL Avatar. Now the system is being changed to take shape information for clothes/attachments from how we weight our rigged attachments. I am guessing how the actual avatar’s shape is rendered is not changing. If it were, that would risk breaking things. But, I could be wrong. I’m not going to dig into the viewer code to figure out what is actually happening. But, Gaia seems to think like I do, that we will have to combine weighting for SL Base and Deform bones to get mesh clothes that work well with the SL Avatar. Weighting to the SL Base to get good movement that follows the avatar’s movements and adding weighting to the Deform/collision bones to get our clothes to follow shape changes. Plus there are some complications for how height and body thickness are handled, which I have yet to figure out. While it all sounds complex and is, it is only something that has to be done once to create a well weighted item, which can then be used for all future items one builds. I am certainly finding it a challenge to figure out just how all this is going to work. I would like more time from the Lab with Fitted Mesh in beta. But, that has downsides too. Remembering what happened in the case of the Mesh Deformer: where less and less knowledgeable people were coming in late in the process wanting more and more features… eventually stalling the project. I’ll be careful what I ask for. This time I think the Lab will take the early feedback and go with it to avoid a similar confusion build up. So, if you are working with the new Fitted Mesh or have worked with making the Liquid Mesh clothes, now is the time to get your feedback and suggestions in. [23:00] Gaia Clary: Hi, Nalates. I just read your article about Fitted Mesh. I believe there are some confusions in it. (you never rotate the Collision Volume Bones, you do NOT need to weight to CV’s AND SL Base bones at the same time….) [23:01] Gaia Clary: We are still trying to find out a good way how to handle all of this in Avastar in a way that it becomes less confusing. [23:02] Gaia Clary: its ugly as it is now…. This entry was posted in Mesh, Second Life and tagged Fitted Mesh. Bookmark the permalink. How does this match the existing RedRig and Liquid mesh techniques? I was under the impression that it was essentially the same, with the addition of new bones matching the physics sway of body parts, but I was recently (and most emphatically) told that this is *not* the case, and that LL is adding more bones than just the sway bones, allowing for a far better fit than the “hacky” Liquid mesh. This contradicts what I’ve read about it so far, but I may have missed something, and the person claimed knowledge of the running code, something I haven’t looked at myself. My understanding is that when a project viewer is released the code is also released. So, some people have looked at the code. But, the Lab tells us they have added only added 7 bones. See: https://wiki.secondlife.com/wiki/Mesh/Rigging_Fitted_Mesh. In reading what Gaia Clary has written I found a reference to 130 bones. I think the 130 number excluded the 7 new bones. But, I have not seen where that number comes from or find any list with 130 bone names. You can look in the SL/character folder to find XML files that are part of the avatar’s definition files. So, someone quoting knowledge of the code does not mean they are all knowing or in possession of complete understanding. I take such claims and other information into consideration and then test it all. From this article and the comments you can see there are mixed opinions on how fitted mesh will work. Then we also have the matter of how Avastar will work. As of now, the SL Avatar and the Avastar avatar do behave identically. Nor do I see people writing about experiments with Fitted Mesh. So, for now I can only definitively say I have yet to figure out what the Lab has done to get the new bones working or how they weighted the skin for the new bones. I just wanted to clarify that you never animate using the collision bones. You only weight to the collision bones and animate using the standard bones. The standard bones have the correct pivot points etc. Never ever ever bend the collision bones. The movement of the collision bones are dictated by the standard bones. 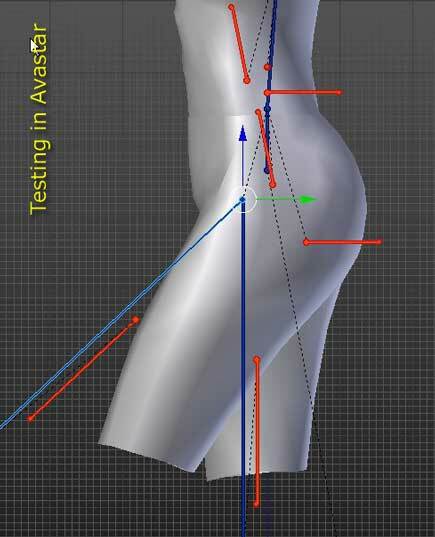 So weight to collision bones and bend and animate using the standard bones to test your rigging. Then I realize that Gaia already responded to you about this oopse!